I'm going on a short vacation tomorrow with the kids and my husband and before I go, I'd like to share with you one of the layouts I taught at the Creative Workshops in Indonesia. I had four busy, crazy, fun days teaching in Surabaya and Jakarta. The ladies there were so talented and so nice. I'll post pics from the classes soon. Huge thanks to My Scrapbook Ideas and Paper Land for inviting me over to Indonesia for a second time. Thanks for your visit! I'll be back soon. I had the honor of heading a small class composed of a bunch of chatty, funny, and creative ladies tonight. I designed and taught these three layouts and we used Graphic 45, GCD Studios and Little Yellow Bicycle papers, together with Prima Flowers, and Tim Holtz Alterations Dies. Stamps are by Inkadinkado, Unity, and Stamper's Anonymous. I had fun doing these layouts and hanging around with the girls tonight. Till next time! Hi! To all the participants of the Prima Class, I'll see you on June 12, Saturday at 9 a.m - Lasting Impression Store, for the last class in our Prima Classes series 1. I'm pretty excited about our session on Saturday cause this is my favorite of all the three classes. At the end of the day, you will have one layout and one muse to take home and display in your scrap room. We will paint, cut, collage, distress, emboss, ink, and melt stuff!! We will play with gesso, UTEE, alcohol inks, metallic clay pigments, gold dust, paint, and a lot more! Also, each participant is assured of one raffle prize. So please do come on Saturday. Instructions and pictures will be emailed to those who can't attend but I think it may be harder to follow as compared to the live class. Jamie, Rose, Myself, Val, Wendy, Mariam, Lilian, and Jasmine. - Taken on the 2nd day of class. ... with Val, waiting for a table at Madam Kwans. The food was soooo good! I had a spicy chicken dish and I could not stop eating even when my nose got all runny becuase of the chilli. Valerie knows exactly where to take us for really great dining. ... tossing the new year salad with Bryan, Michelle, Agnes, and Jessy (she was the one who took the pic here). Here is one Michelle, Agnes and Jessy. We went shopping at the Pavillion Mall. Michelle also took me to China town where I scored some really great bargains. Found some really nice metal charms and two vintage manequins. Will take pics of those soon. Thanks loads Michelle! Thanks to all of you ladies who made my Malaysia trip so memorable. Special thanks to Val's mom who welcomed us into her home on our first morning in Malaysia. We arrived 12:30 in the evening and it was too late to go to the hotel where we were booked so she graciously accomodated us for that night. She is such a good cook too! I will never forget the cake she baked for everyone who attended the classes. 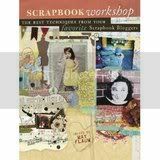 Valerie, thanks for inviting me to teach at Scrap-N-Crop! I loved my visit to Malaysia so much. I hope to go back there again one day. Ok, I was out of the country when the Pencil Lines sketch came up so even if I'm a few days late... here is my contribution for sketch 171. Our guest designer is Kiyomi Kumagai from Japan. Hope you can visit the site to see her work and the desing team's takes. Hope you can create with us as well. 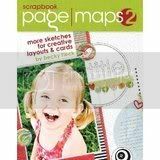 One winner will be drawn to get a kit from Scrapbooking From The Inside Out. This was also one of the layouts I taught for the class I did for Visual Creations. Technique: use of Clear Tar Gel and Glass Glitter. I just came back from spending a weekend at Brunei where I taught for two days at Shabby Chic. I had such a wonderful time there meeting the scrappers and finding new friends. The classes were fun and we hardly noticed the passing of four hours. Beverly and Irene who are the owners of Shabby Chic took us out several times to try the fabulous food at Brunei. The food was great! And the accomodation was also wonderful. The room was HUGE!! I was glad Bry accompanied me. It was good to be able to spend some time just as a couple again. I also got a chance to see most of the tourist attractions of Brunei last Monday and learned a bit about their culture. Thanks again Bev and Irene for inviting me over. To all the scrappers who attended the classes - thank you very much and I hope to see you again in the future! Hugs! My next stop now will be ... Malaysia! I can hardly wait! You can check the details HERE. For now, I have another on-line class, this time in Blue Bazaar Australia. Please check here for the details. click on the NEW PRODUCTS for December to see the kit.